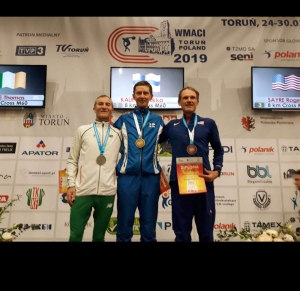 TOMMY Payne from Tinryland athletic club and representing team Ireland had an unbelievable few days at the World Masters championships in Torun, Poland. First up for Tommy was the 3km indoor final in the magnificent Touron Arena which hosts the indoor equivalent of the Diamond League annually. From the gun, Kazakhstan athlete Sergey Polikarpov went out at world record pace and brought Finnish athlete Jukka Kauppila with him. Tommy realised the pace was too strong and settled in the group sitting in behind the English athlete Fletcher. After about one kilometre, Tommy made a move which broke the English athlete and he was a clear third ahead of the chasing group. Up front Polikarpov was relentless in his pursuit of a new world record and he was suitably rewarded with a magnificent new mark of 9:43 with the Finnish athlete second four seconds further back. Tommy was third in 10:03. This was a fantastic run by Payne who has been nursing a niggling injury over the last couple of weeks. There was no rest for the wicked and 24 hours later Tommy lined up for the 8km cross-country which was held on a challenging course, with soft sandy hills and very tough underfoot conditions. Tommy was always to the fore and was up front challenging with the previous day’s silver medallist Kauppila from Finland and the fresh Roger Sayre USA who had not raced the previous day. Kauppila made a mid-race surge to pull away from the chasers and he got a lead which he held all the way to the line. In a great battle for the silver medal Payne just got the better of the American by four seconds to ensure his second medal of the championships. Payne is no stranger to winning medals and titles and in fact is the record holder with 13 Carlow senior cross-country titles. He has numerous Leinster and national titles over a variety of surfaces and distances. As far back as 1991 Tommy was a scoring member of the Irish team that won bronze at the worlds hill-running championships and he also competed previously in the world half-marathon championships. He is many times British and Irish cross-country champion and has won silver at the European masters 3km indoor championships in Madrid 2018 where he had beaten Kauppila. There is no doubt there will be more medals and titles heading to Carlow for this dedicated and popular athlete.